I had read that Hoi An is one of Vietnam’s best destinations, but I had no idea how much we all would love it here. 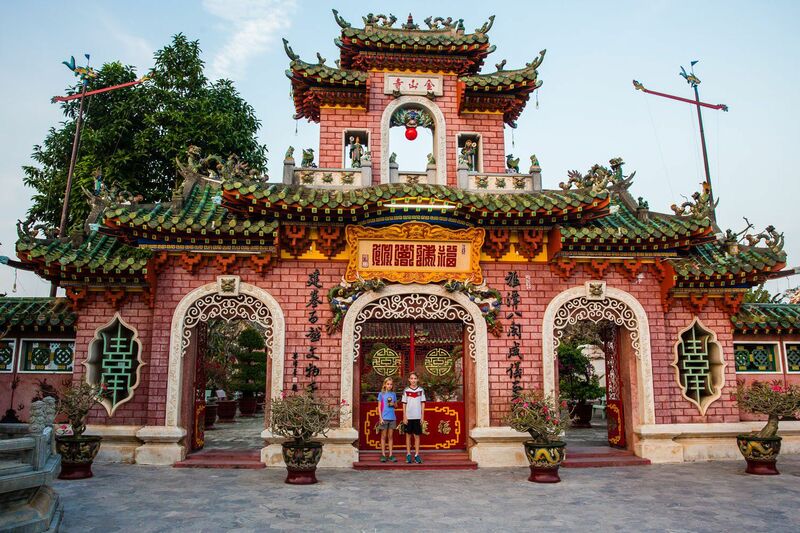 There is something in Hoi An for everyone…a quaint, old town perfect for strolling, shopping, and dining, awesome beaches for the kids, and a perfect mix of countryside and villages to be explored by motorbike. We spent three and a half days here and could have been happy with a week or more. 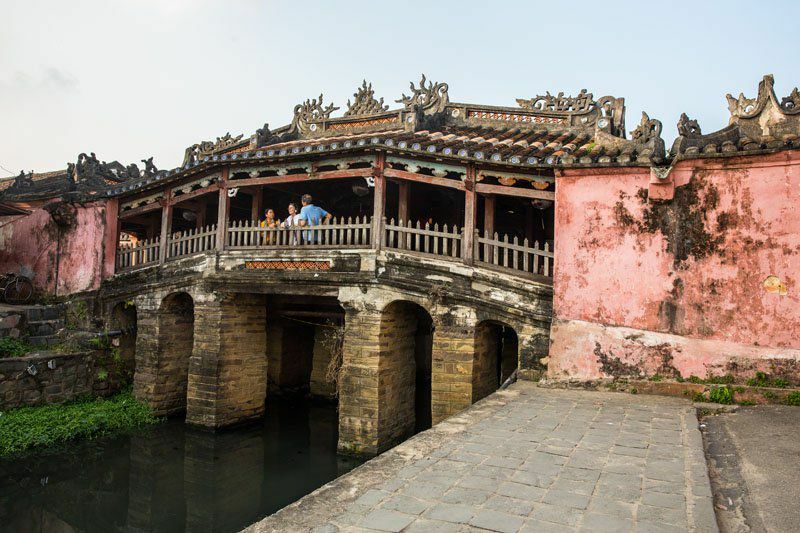 Hoi An is a UNESCO World Heritage Site, located just a half hour drive south of Da Nang. To get to Hoi An, we flew Vietnam Airlines from Ho Chi Minh City to Da Nang and then had a driver from our hotel transport us to Hoi An. During the month of February the weather is perfect. The mornings would start out overcast and cool, but by noon it was bright and sunny with temperatures in the mid 70’s. It was wonderful to get a break from those 90° plus days we’ve been having for the past few months. 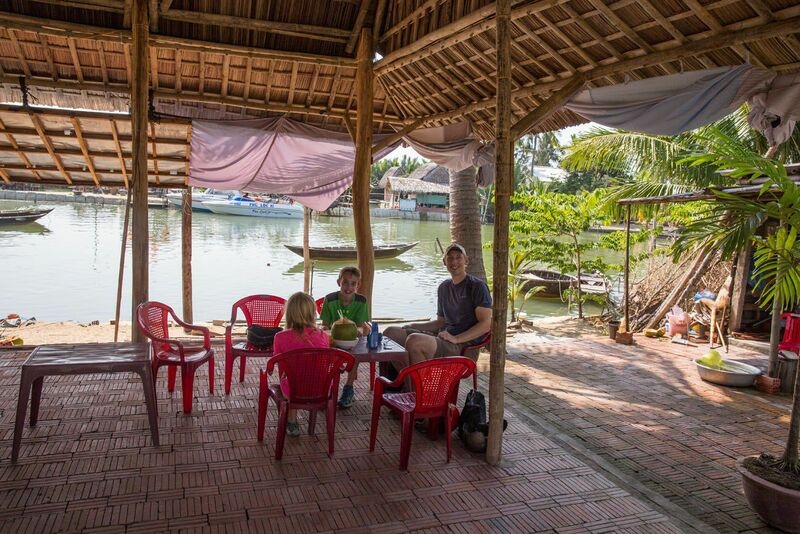 From our hotel, the Golden Bell Homestay, we would borrow free bicycles and ten minutes later would be parked in the heart of Hoi An. Tyler and Kara loved cycling through the streets, dodging cars and motorbikes and pedestrians. The streets in Vietnam can get chaotic, making it so much fun for our kids, like playing dodgeball on a bicycle. The main section of Hoi An is closed off to cars and motorbikes, making it much more pleasant for walking around. 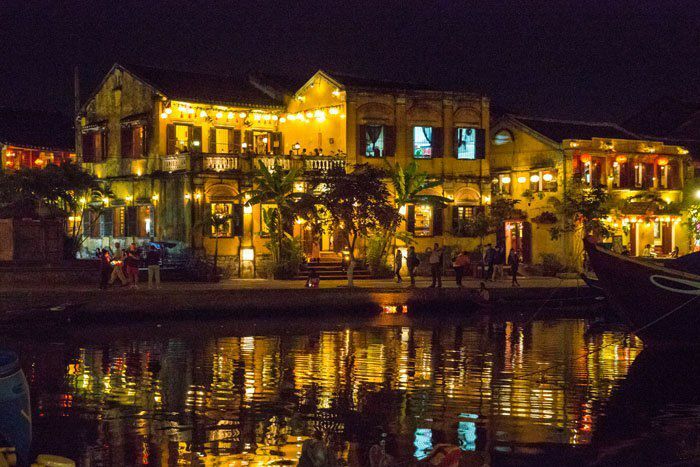 Hoi An is one of Vietnam’s best destinations for dining. This is the perfect place to grab a seat at an outdoor cafe, have a drink, and watch the sunset over this historic city. We ate in Hoi An three of four nights while staying here and most restaurants sell a mix of Vietnamese food and western/European food. 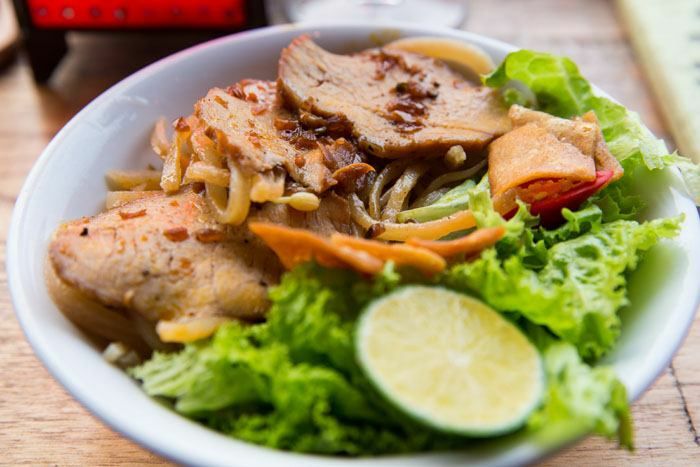 One of Hoi An’s more famous dishes is Cao Lau, a bowl filled with thick rice noodles, pork, and local greens. The dish is seasoned with fresh lime juice and red chili peppers and tastes delicious! 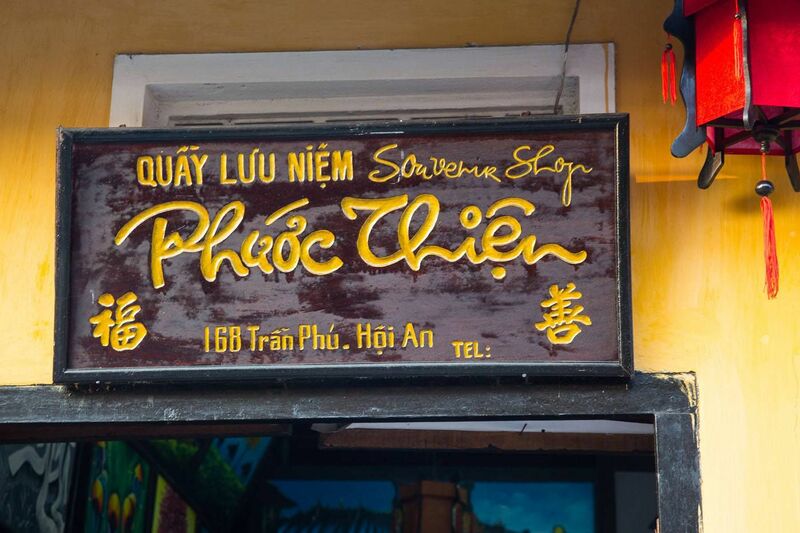 Hoi An is also popular for its numerous tailor shops. Visit a shop, pick out your favorite fabric, usually silk, and by the next day a hand tailored suit will be awaiting pick up. We did not purchase any suits and we did not buy much of anything in Hoi An, but we did enjoy window shopping. 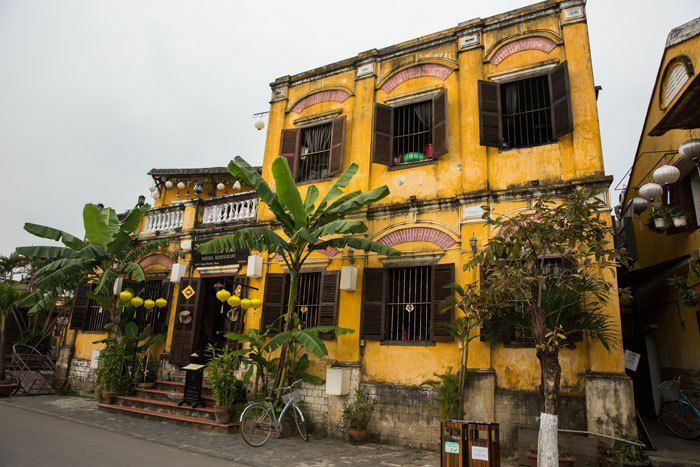 Hoi An is also filled with ancient historic buildings. The most famous is the Japanese Bridge, which dates back to the 16th century. 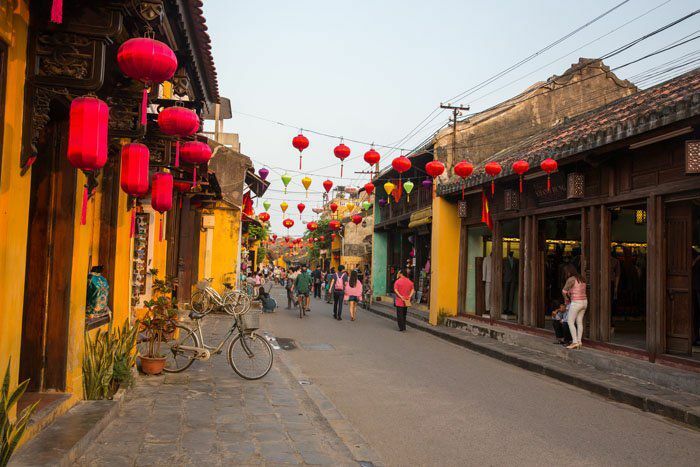 During the 18th century, Hoi An was the most important trading port in all of Asia, linking Japan and China with the rest of Asia. 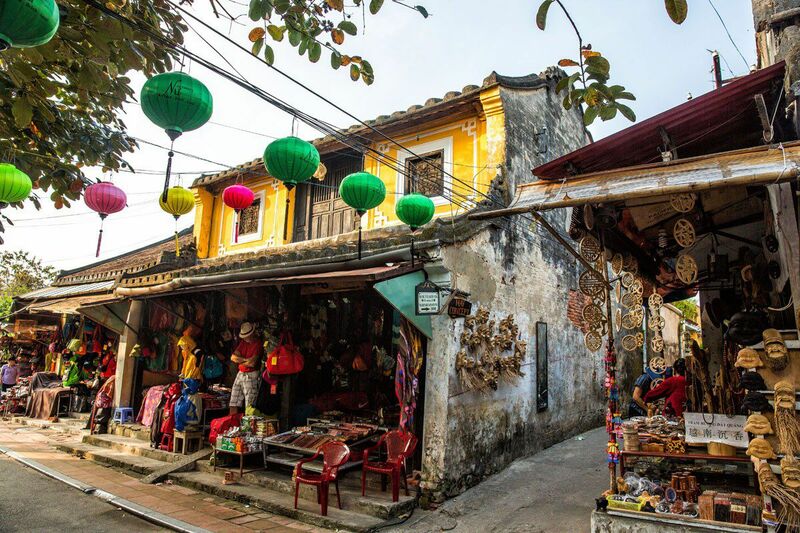 In Hoi An, there is a law stating that every shop must hang lanterns from their facade. 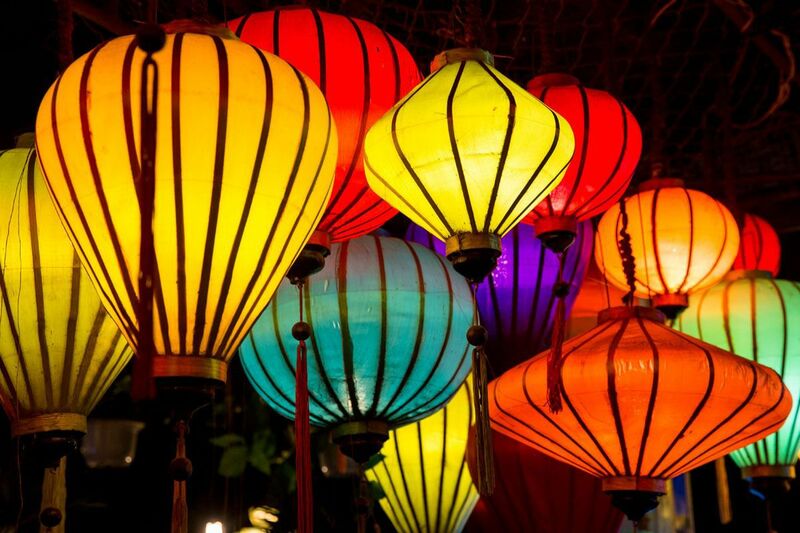 As the sun sets, the lanterns turn on, lighting up the town in the warm glow of yellow, red, and green light. 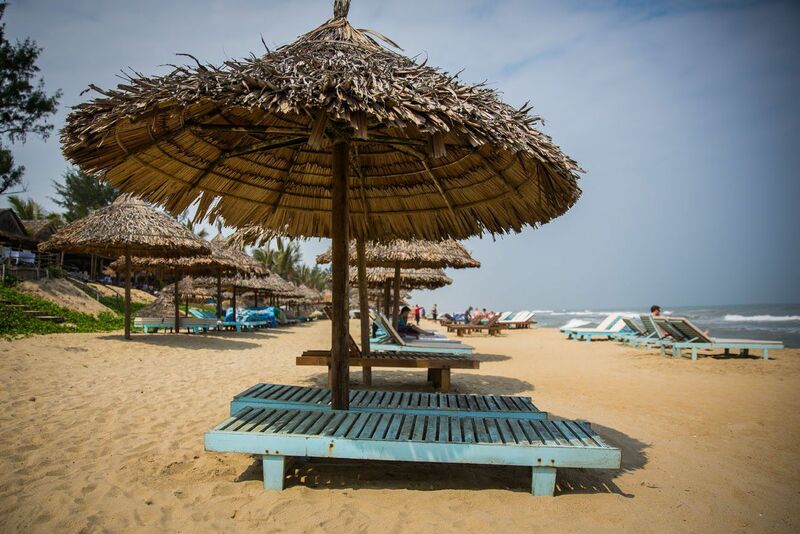 If you ask Tyler and Kara what was their favorite thing to do in Hoi An, they would very enthusiastically answer, “the beach!” From our hotel, a ten minute bike ride in the opposite direction from the old town of Hoi An, is the South China Sea and a long stretch of amazing coastline. We came here several times, eating lunch at one of the cafes that overlook the beach and giving Tyler and Kara some playtime in the water. Even though it was February and daytime temperatures were a little on the cool side, Tyler and Kara were eager to play in the ocean. We have not seen a beach with waves since South Africa. 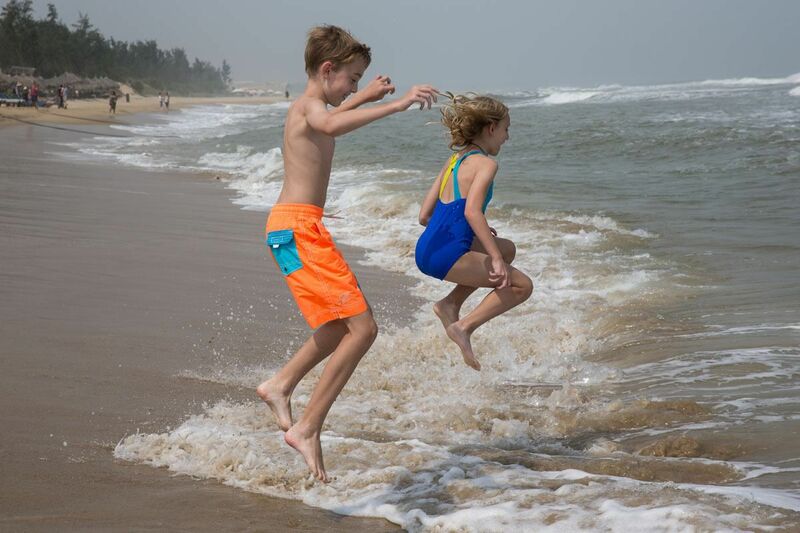 For kids, being at a beach without waves gets boring rather quickly. These waves were almost a little too rough and they couldn’t go out very far without being knocked over. That made it even more fun! So here we are, on a beautiful beach on a postcard perfect day, so where are all of the people? This is a great beach destination…low cost accommodations, great food, great weather…we loved it. And for those who like luxury resorts, just south of Da Nang are world class five star resorts like the Hyatt and Vietnam’s luxury hotel line Vinpearl. Between the beach and our hotel are large fields of rice paddies. 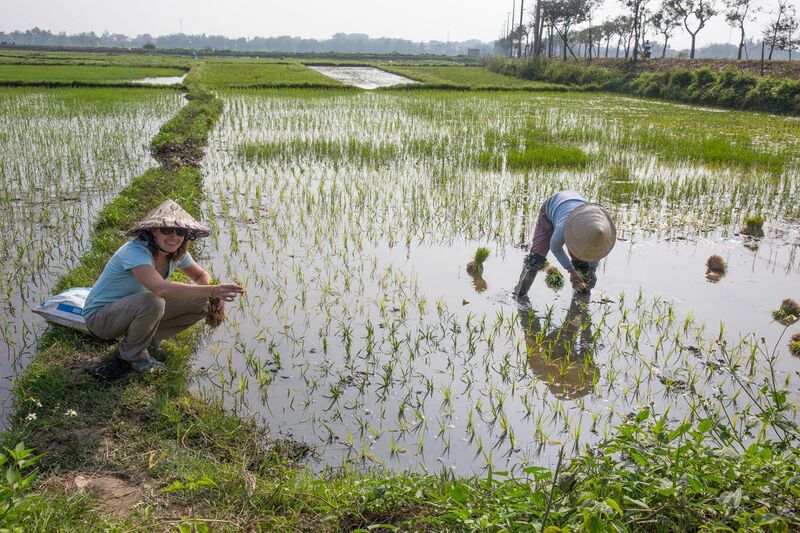 We could ride our bikes on the small dirt and concrete path among the rice fields, enjoying the scenery and meeting the people. 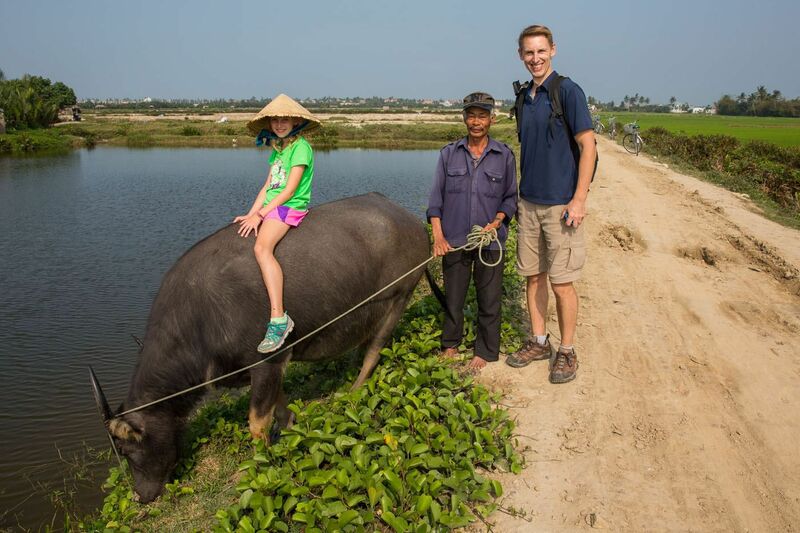 Kara got a chance to sit on a buffalo and I learned how to plant rice. I was handed a bunch of rice seedlings which looked like a wet clump of long blades of grass bound together with a rubber band. One by one I pulled off a seedling and plant it in the ground. Just underneath the water’s surface was very wet soil. All I had to do was to gently push the seedling down into the soil. Simple! Easy for me to say. I just planted ten to fifteen seedlings. 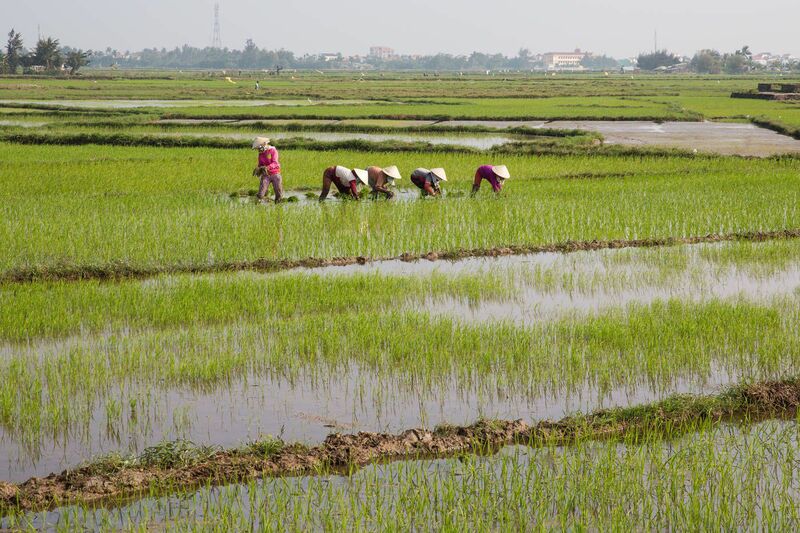 These men and women spend all day bent over at the waist, planting new seedlings or harvesting the rice that is fully grown. Tim’s favorite activity was renting motorbikes for the day and exploring on our own. 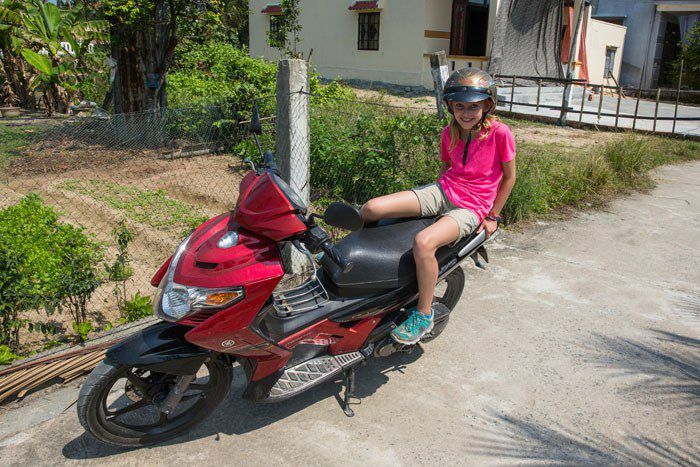 We left Hoi An, rode along the coastline, and explored the narrow, residential lanes outside of the city. Still new to driving motorbikes, there was an element of excitement just getting out on our own and wandering through the countryside. At one point we stopped to take a break along one of the many canals. It was here that we were invited to join Quan at his house. We drank fresh coconut water while watching life along the river. Quan knew hardly any English and we know only a few words of Vietnamese but we still enjoyed each other’s company. He was thrilled to have Tyler and Kara as guests at his place. 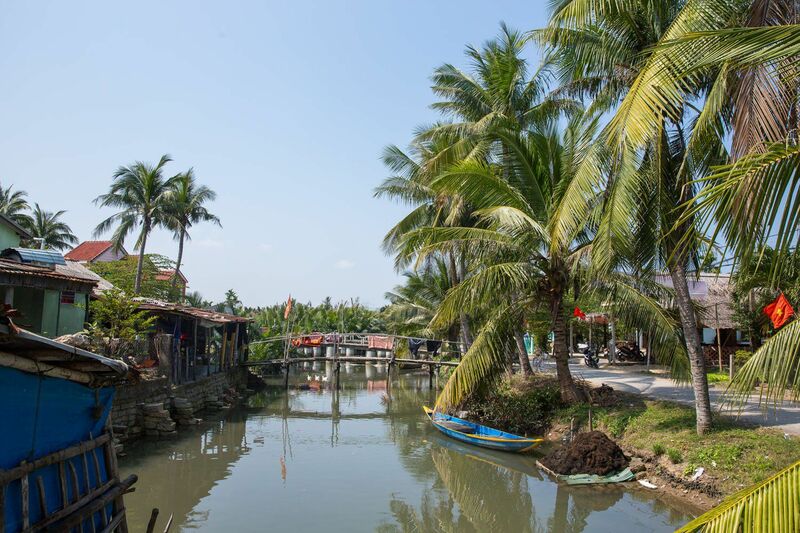 Hoi An is located on a river delta and we rode on street after street located along the water’s edge. 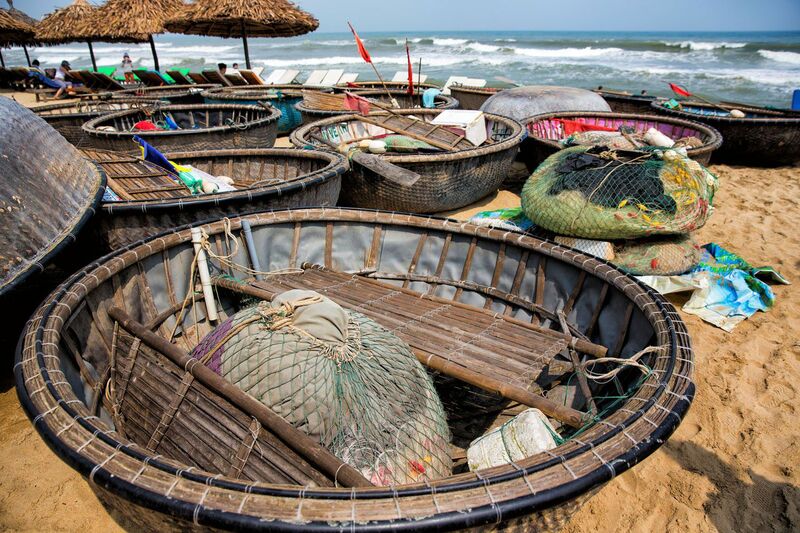 Most people get around by motorbike but fishing boats and round bamboo boats are very popular as well. This seemed like a great place to live…palm trees by the water, the people were friendly and happy, and life here seemed to be very peaceful. 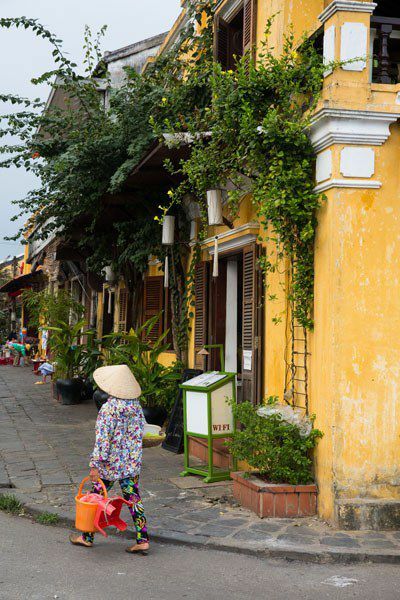 Hoi An, the perfect mix of history, culture, shopping, cuisine, and relaxation. It was so much better that we expected and a place worth coming back to in the future. 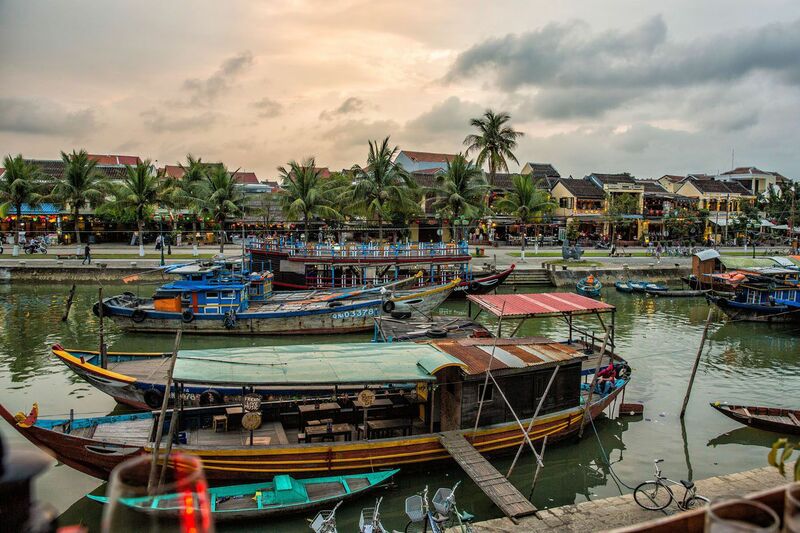 For anyone considering a visit to Vietnam, put Hoi An at the top of your list! 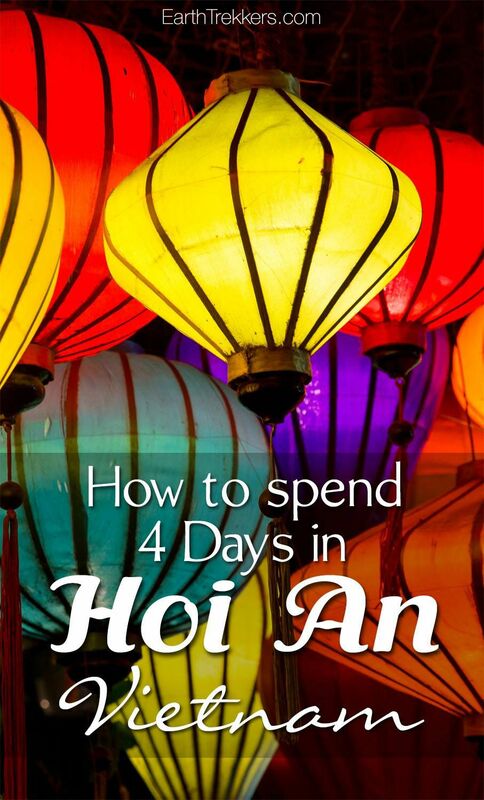 I recommend a minimum of three full days to explore all that Hoi An has to offer. This gives you enough time to see Hoi An and its beaches, spend an afternoon in Da Nang, and maybe take a day trip to My Son (see below). 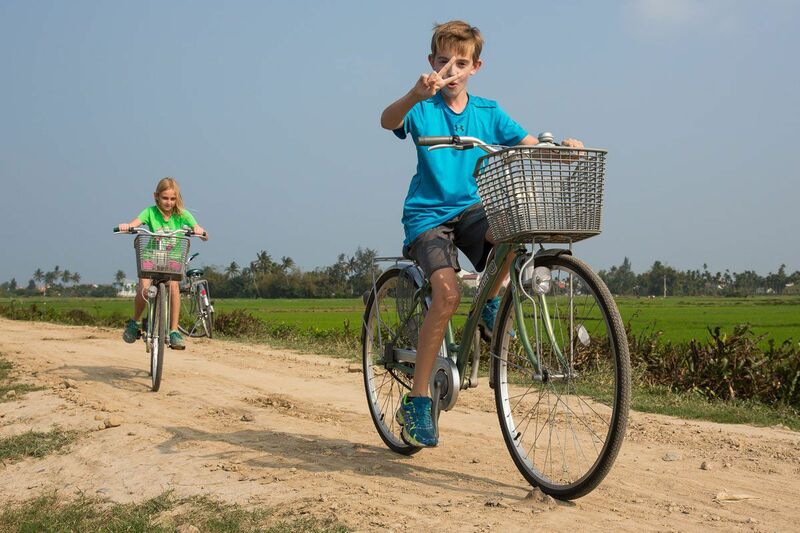 Having more time makes it possible to really get to know Hoi An, take a cooking class, or take one of the many bicycle or motorbike tours that are popular here. We spent four nights at the Golden Bell Homestay. This hotel is located on a relatively quiet city street about 2 km outside of the main area of Hoi An and about 3 km from An Bang Beach. The rice fields can be seen from the upper levels of the hotel. They have bikes available for free and taxis are a cheap way to get into town. We had two double rooms at $30 each. The rooms are large, clean, and very comfortable with a TV with movie channels, air conditioning, and a modern bathroom. My only complaint is that the hotel is noisy. At 4:30 am we could hear the hotel staff banging dishes and getting ready for breakfast and there was a rooster next door that woke up the neighborhood during the early morning hours. For us the rooster wasn’t such a big deal; we have had that at so many places by now that we are all used to it. Many people take a day trip from Hoi An out to My Son Holy Land. We made the trip as well. 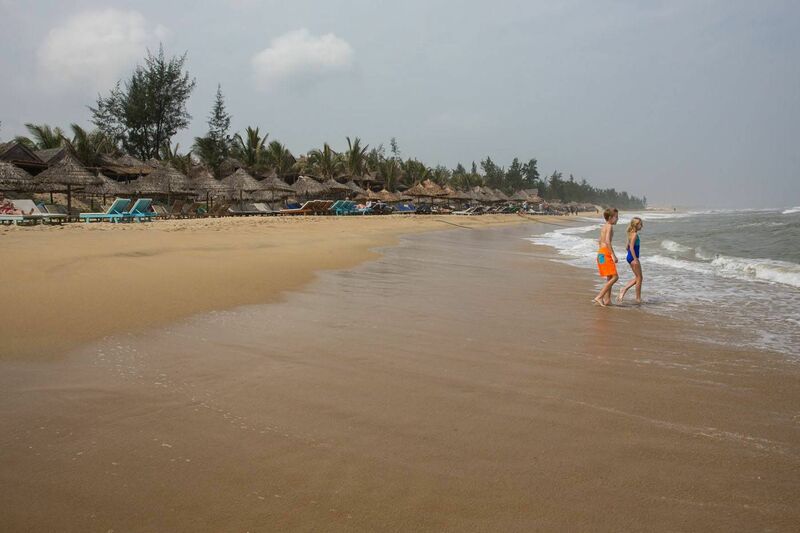 My Son is located an hour and a half by car west of Hoi An. It is also a UNESCO site that is home to ancient Cham temples. It reminded us of a smaller version of the temples in Bagan, Myanmar or Angkor Wat, Cambodia. This site is much less impressive, due to its smaller size. It doesn’t help that US Army bombs destroyed some of the temples of My Son during the Vietnam War (the Viet Cong was using My Son to stockpile their artillery). In our opinion, visiting My Son was not worth the time and effort. It was small, crowded, and honestly not very exciting. The best part was heading inland from the coast, traveling up into the misty mountains, where temperatures got a lot cooler and the scenery changed dramatically. Read more about My Son here. 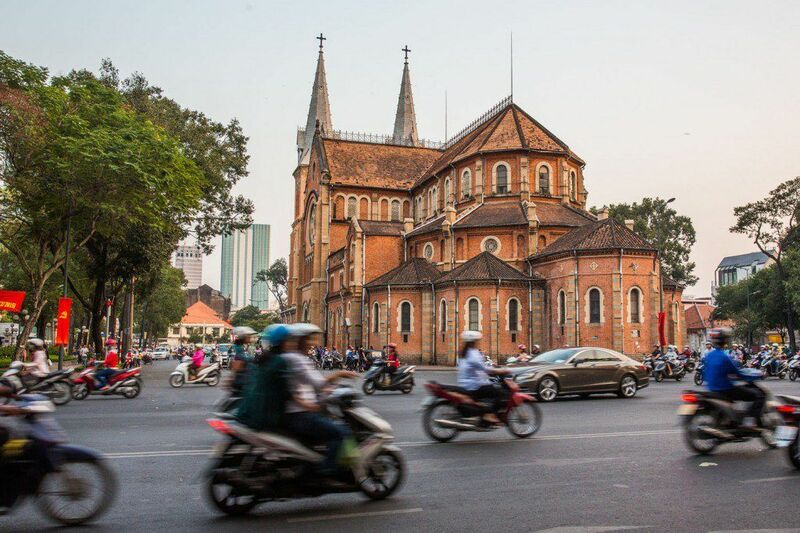 Should I Travel to Vietnam During Tet? 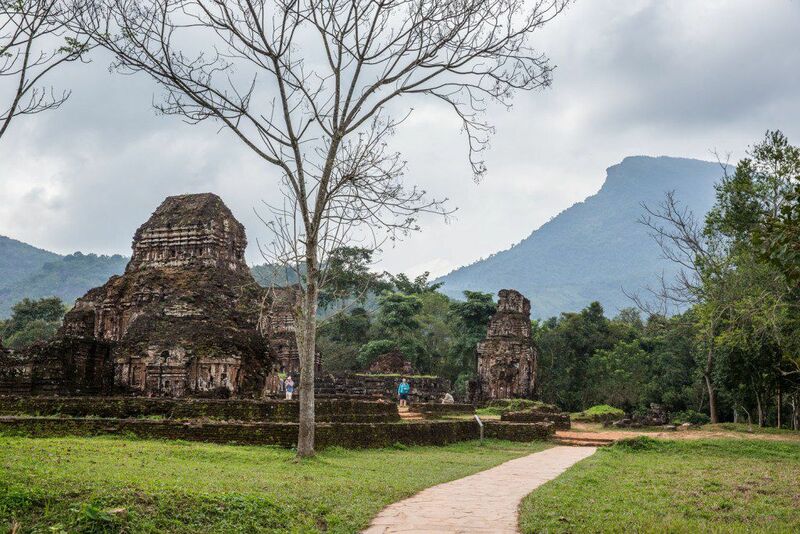 Planning a trip to Vietnam? 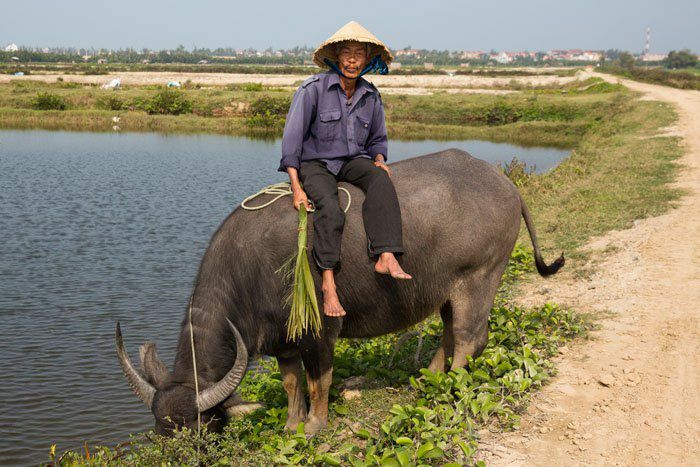 Read all of our articles in our Vietnam Travel Guide. Yes, I think 5 days would be great. 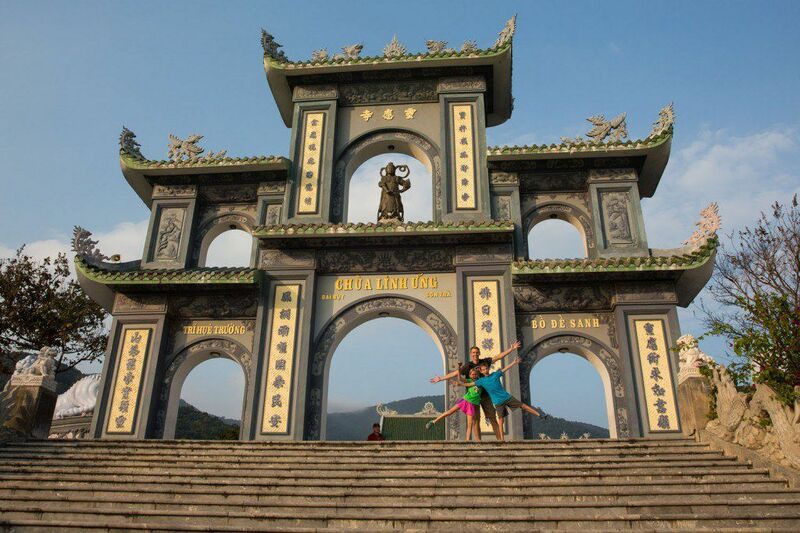 It’s enough time to explore the town, go to the beach, and make a trip to Da Nang. Cheers! We hired a private driver. Check out this post about visiting My Son. Love your blog, congratulations it is a really enjoyable read. 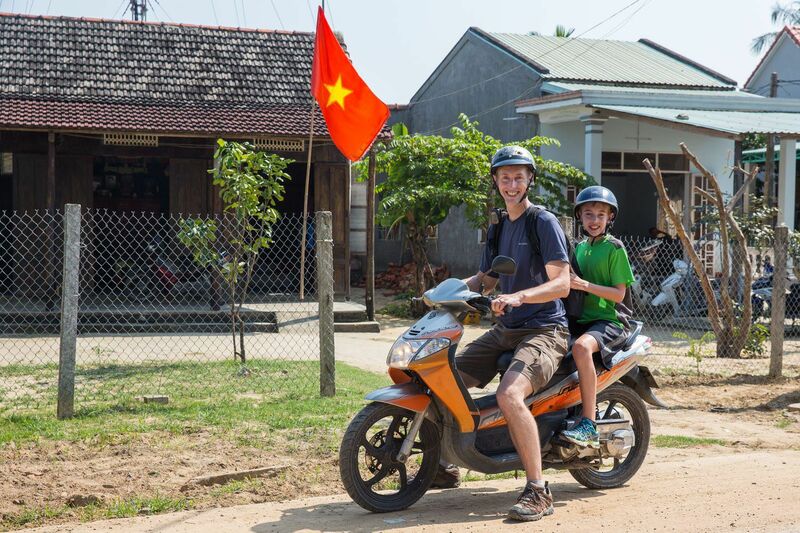 I stumbled across your blog last night whilst researching a trip to Asia with kids for early July, most likely to travel between Hanoi and Hoi An over 17 days. Must admit I’m really struggling to get too excited about the destination, but with much of Asia in the midst of the rains there’s not a lot of great options weather-wise. We loved travelling in Myanmar 2 years ago and we have previously enjoyed exploring off-the-beaten track parts of Thailand, Sarawak and even Bali as a family. It is a toss-up between Vietnam and a Luang Prabang to Chiang Mai journey (with a week down south at the beach to follow). What was your overall opinion of the north half of Vietnam? We really liked Vietnam. 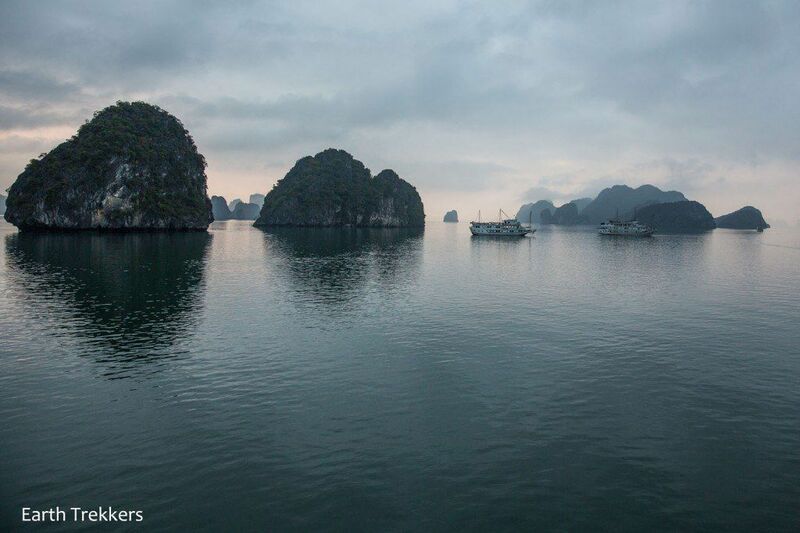 The food is amazing, we loved wandering the streets of Hanoi, and of course the cruise to Ha Long Bay. We never did make it to Sapa, unfortunately. I would say that we probably preferred northern Vietnam to southern Vietnam, with Hoi An being our favorite spot. Luang Prabang is awesome. 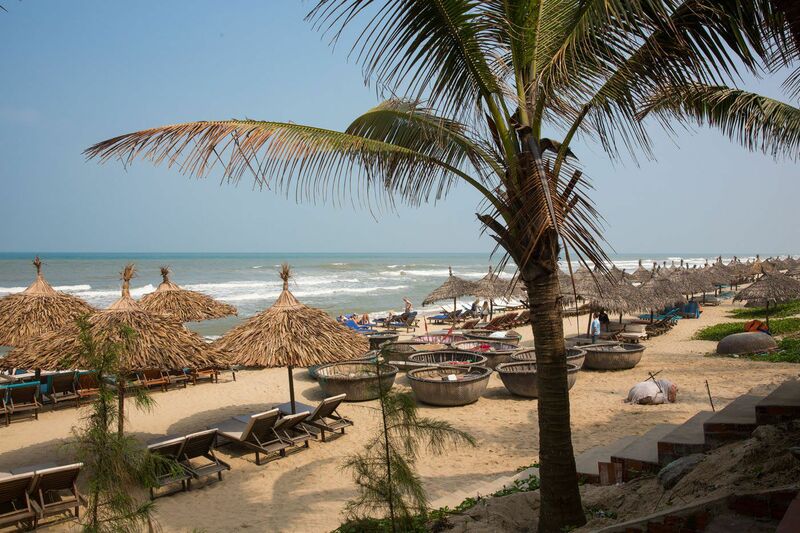 Could you do a Hoi An, Hanoi, Luang Prabang trip? 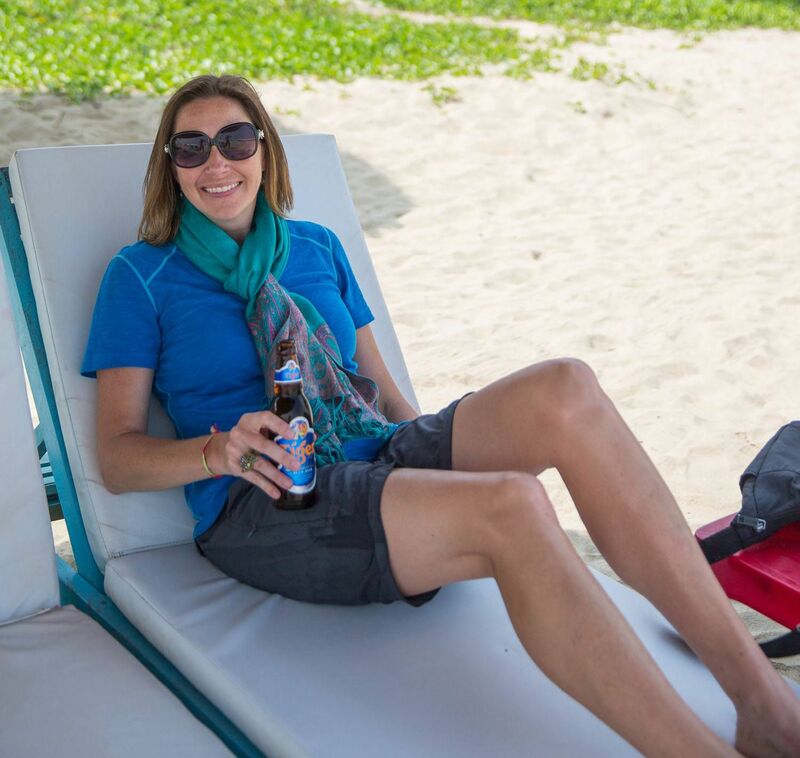 Thanks for that Julie, we’re going for it – Hanoi to Hoi An. I had 10 days in the South back in 2000 or so and didn’t much take to it, but if Vietnam is anything like other places we’ve travelled, having kids with you makes for a very different, often more positive connection with the local people. Matt – can I ask how your trip went? We have two months to spend in Southeast Asia during the fall, but we like to travel slowly. Thinking 2 destinations, 1 each month. I’m leaning towards Bali and Hoi An, but am curious if you made it Chiang Mai and how you found it? We tend to go for the smaller, quieter cities with plenty of outdoor activities. We’ve been following the Earth Trekkers for months now, they were a huge help to us in South America and now I’m turning to the blog for Asia tips. Your journal is so helpful as I plan my trip to Vietnam. Really enjoyed your pics. Thank you! Thanks for this post! 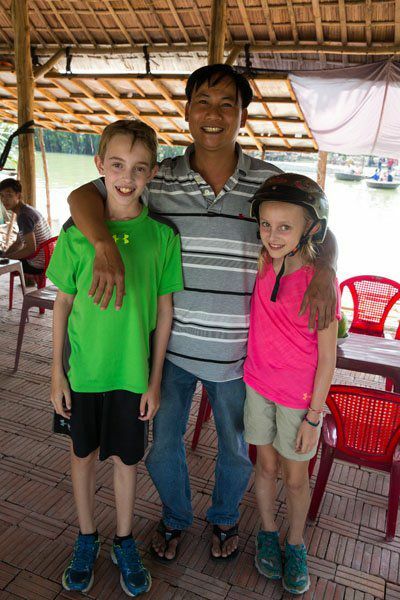 We joined the bike tour-full name Hoi An Fun Bike Tour. Our guide name’s Nancy who is the senior of Hoi An Free Tour organization. It’s amazing experience. She was so informative, kind and spoke very good English and we learnt so much from her about the culture and heritage of Hoi An, she also had a great sense of humor. The photo opportunities were great. 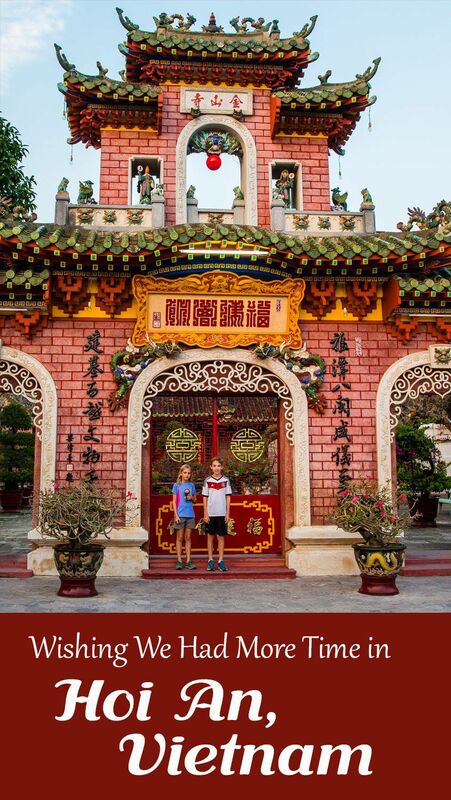 This is a must tour in Hoi An and we cant recommend highly enough. I have so enjoyed looking at your pictures. You have quite the eye for capturing the moment. I hope a picture book is in your future plans. What an incredible journey. Julie, I’m glad that you are enjoying your travels. Everyone here is going to be envious of you sitting in that chair on the beach. It is bitterly bitterly cold here. Snow last night. Schools closed. The weather you describe sounds perfect right now. We are not missing that terribly cold weather at all! !